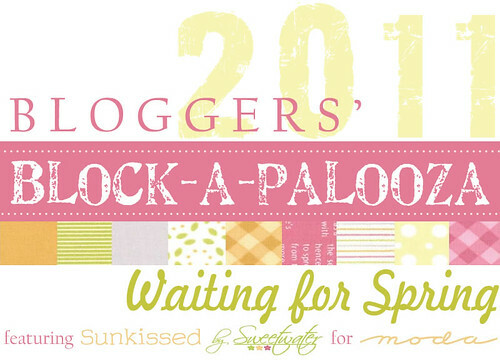 Welcome to the first week of the first-ever Bloggers' Block-a-palooza quilt-along! I appreciate all of the excitement and enthusiasm that everyone has expressed over this project, and I know you're anxious to get started. Thanks also for your patience and understanding as we've pulled together all of the final details for the project. As you may imagine, a project like this is not a small undertaking, and all of us involved have done the best that we can! I know there are some continuing conversations about fabric selections and requirements over in our Flickr group, so please be sure to join in all the fun happening over there. Oh, and post your blocks! Regarding fabrics, with all blocks, please feel free to use the same fabrics as the block designer, or go out on a limb and make your own color combinations. 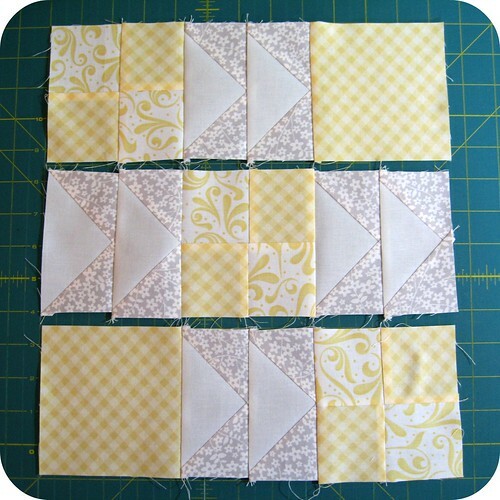 I think much of this fun of this quilt-along will be seeing all of the different variations. One more thing: we'll be posting 2 blocks per week -- one each Monday and one each Thursday. Understandably, this is a rapid pace for some, but you should not feel bad for following along at your own pace. The best thing about the internet is that these tutorials will live on for weeks, months, even years after we wrap up, so please don't feel any pressure to stay on track or feel any guilt if you fall behind. The most important thing is to HAVE FUN. I really, truly got into quilting only after I joined Amanda Jean's quilt-alongs. They were both educational and inspirational for me and, with this project, I hope I can do the same for other quilters. Today, I am happy to present the tutorial for our first block. I'm calling this one Flying Over Fields, because I like the image of migrating geese soaring over patchwork fields. I kept to the muted yellow and grey tones of the "Sunkissed" line. I hope you like it! From a printed fabric, cut 6 squares measuring 2.5" each. I used the yellow swirl print from the "Sunkissed" line. 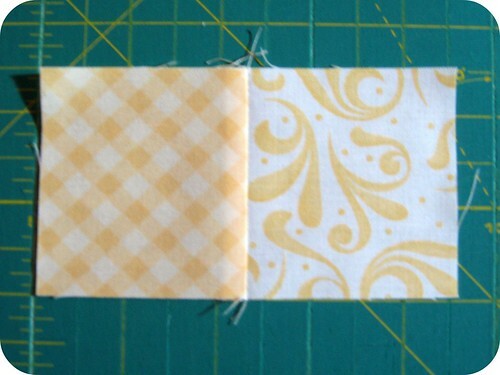 I used a yellow gingham print to coordinate with the swirls in my first fabric. Select another tone from your fabrics that provides a nice contrast to your first two fabrics. I decided to feature grey as my second tone to coordinate with the yellow. From a printed fabric, cut 16 squares measuring 2.5" each. 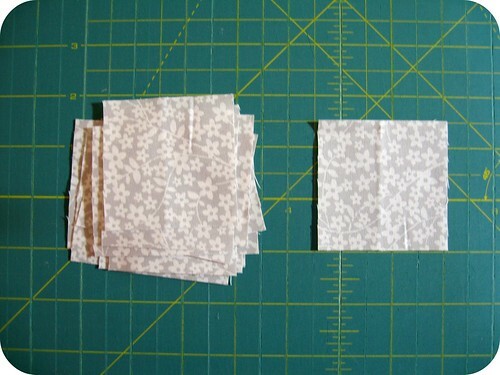 From a solid fabric, cut 8 rectangles measuring 2.5" x 4.5" each. I am using a Moda Bella solid in the "Feather" color to introduce a light grey that coordinates with the print used in Step 3. 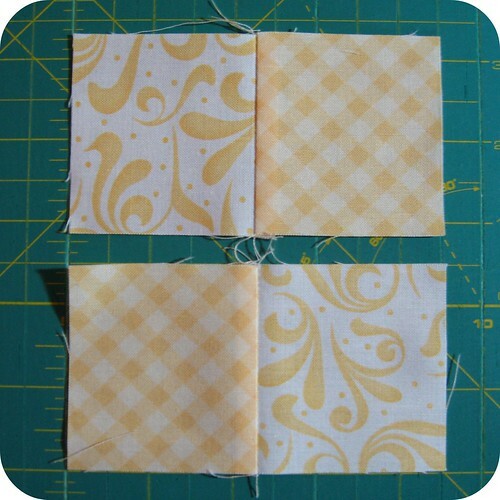 From the 2.5" squares cut in Steps 1 & 2, create a pair of squares using one from each print. 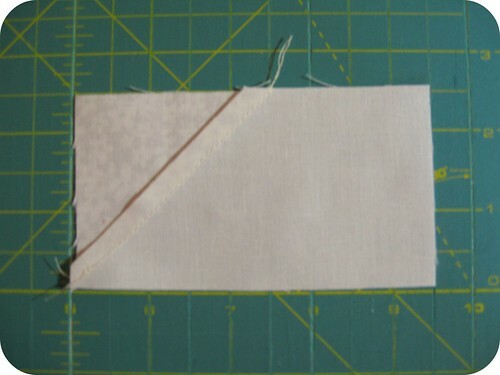 Place the squares right side together and sew along one side, using a 1/4" seam. 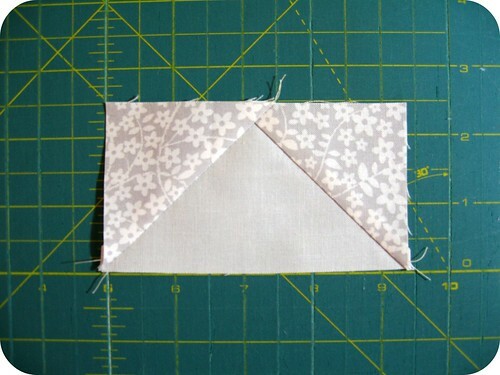 Open the blocks back up and press The seam towards the darker fabric. In this picture, you can see that I pressed the seam towards the gingham print. 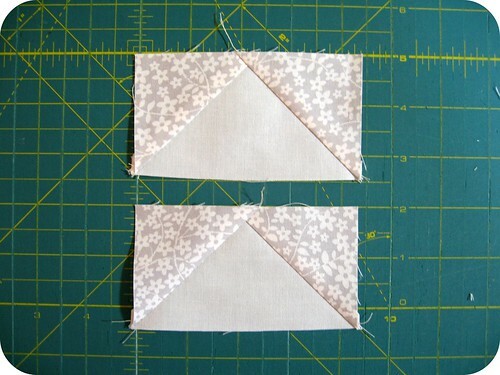 Sew the units together to create a 4-patch unit, and again press the seam to one side. Repeat with the remaining 2-patch units, to create a total of 3 4-patch units. Now we will make some flying geese units. 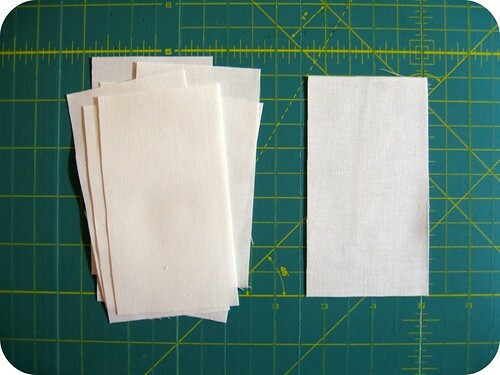 One each of the 2.5" print squares that you cut in Step 3, draw a faint diagonal line on the back (wrong) side of the fabric using a pencil and small ruler. 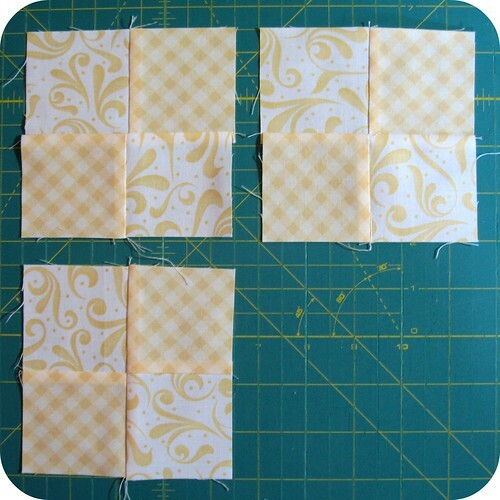 Align one of these 2.5" squares with the 2.5" side of a solid rectangle that you cut in Step 4. 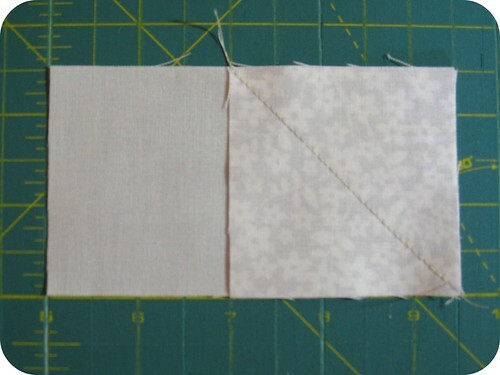 Sew a seam directly along your marked line. Open the unit and press towards the printed fabric. 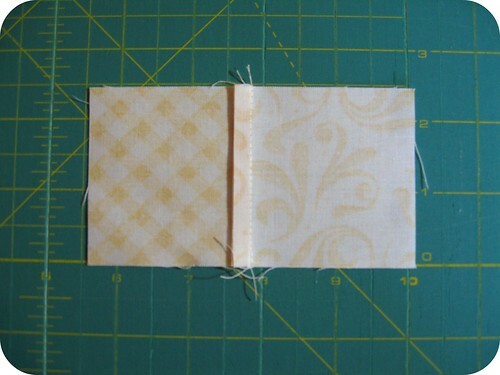 Once it's sewn, trimmed, and pressed open, your block should look like this. Ta-da, you've made a flying geese unit! 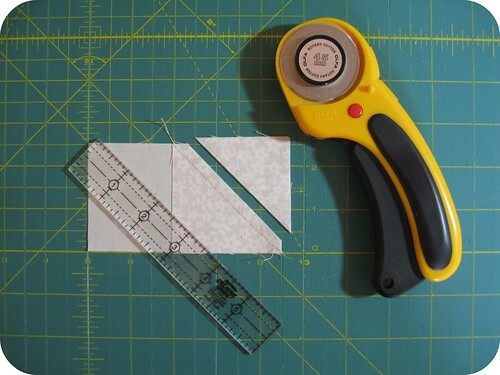 Repeat with the remaining rectangles and squares that were cut in Steps 3 & 4. You will make a total of 8 flying geese units. Separate your flying geese units into 4 pairs of 2 geese each. Sew each pair of geese together, resulting in 4 2-geese units. 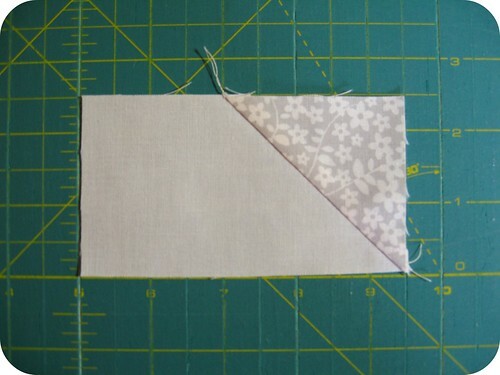 Press your seams (if looking at the picture below, I pressed all of my seams towards the goose on the right). And finally, join your rows to complete you're block. And that's it, we're done! Your block should measure 12.5". It will be a 12" finished block when sewn into the final quilt top. I have now made a PDF version of the tutorial available for ease in printing. You can access it here. I hope you enjoy the tutorial and have fun making your blocks! Please be sure to show off your blocks in our Flickr group. The next stop on our tour will be with Elizabeth on her Oh, Fransson! blog this coming Thursday, January 27th. 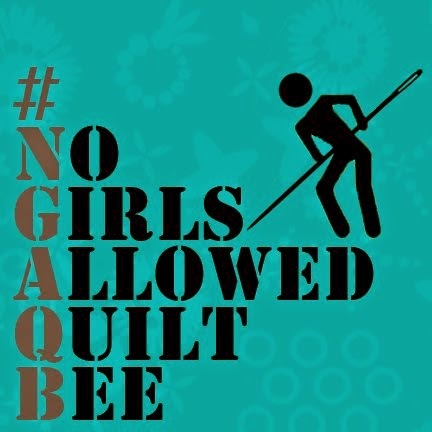 Remember, details about the quilt along (including the full schedule) can be found here and at our Flickr group here. awesome block! cool name too. Thanks for the tutorial on the first block - its lovely! Oh it looks fantastic. Hope my material arriver from the U.S. to UK soon and then I can quilt along. I was so excited to wake up this morning and see the first block! I love it! I've never made flying geese before, so this should be fun. EXCELLENT tutorial. Thanks so much! As much as I would love to join in on this QAL, I am going to just live vicariously through all of you. I will say, though I really like the flying geese. Fantastic! Block One! Got to get the kids off to school and then I can sneak down to my craft room. Great tutorial, can't wait to begin. Never did a block-a-long before so this is exciting for me, waiting to see what block is coming next. Great tutorial and fabulous looking block as well! Thank you! It is a lovely block and a very clear tutorial! 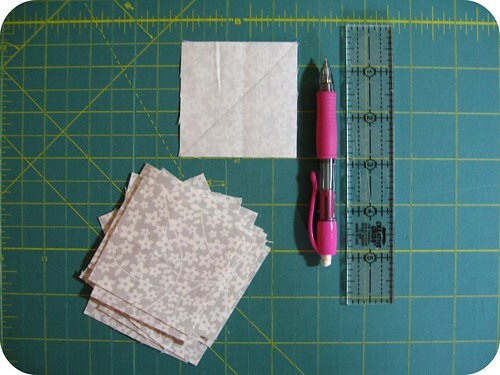 And I really like that you explained how you chose your different fabric prints, because now I can use that thinking in chosing fabrics from my stash! Nice block, John! I hope you're recovering well from your surgery, too!! Very nice can't wait to get off work tonight, and get started. One question though. Is it possible to get the instructions in a PDF format to print out? My computer is on the first floor, and my sewing room is on the third floor. Do you know the final quilt size? I am so following along, and love the first block. Thanks for the first block of the quilt! I can't wait starting sewing mine! Just finished my first block, it's on Flickr if anyone is interested. My solid is slightly different but otherwise looks the same. The tutorial is so easy to follow so thanks very much for that. Can't wait for Thursday now! I think you have done a great job putting this project together. I know it has been a huge undertaking. Thank you very much. I do have two questions. Is there an easy way to save the tutorials on my computer for each block so I can have them in one place? Also wondered if there is a way to print the cutting directions without having to print the whole tutorial? I don't have a laptop and my computer is not in my sewing room. This is so much fun. Thanks for the excellent instructions and photos to make this a great start to my week! 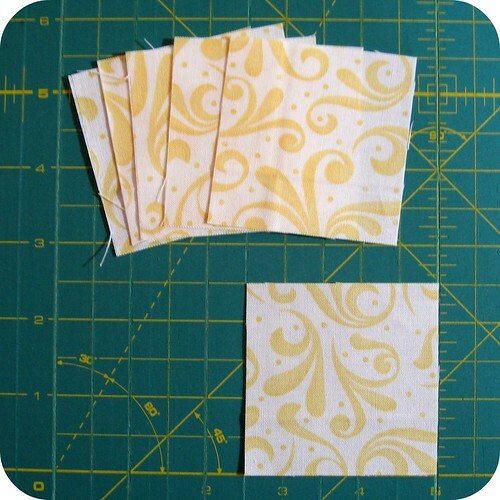 I am using a Fat Quarter Bundle of Hemming House that I won back in October. I love it. I am off to make this block. Thank you for the quilt along. I hope your elbow is better. May I add my request for pdf files of these blocks? It certainly makes the tutes easier to use. I just added my finished block on flickr. Thanks again for all of the hard work that went into planning this for us! I am excited for Thursday's block! Lots of little pieces in this one ~ it would look great on a pillow! my first quilt along. I'm so excited. PDF files would be great. I dont have a computer in my sewing area so I often put my sewing machine at the computer table. I'm using the sunkissed fabric line on the birdie stitches BOM. This BOM is cute everyone should check it out. Is anyone using another fabric choice? Thank you for reminding me that this most likely will live on for years and to have fun. I'm excited about this; but, I am extremely slow especially since I have other "irons in the fire" so to speak. 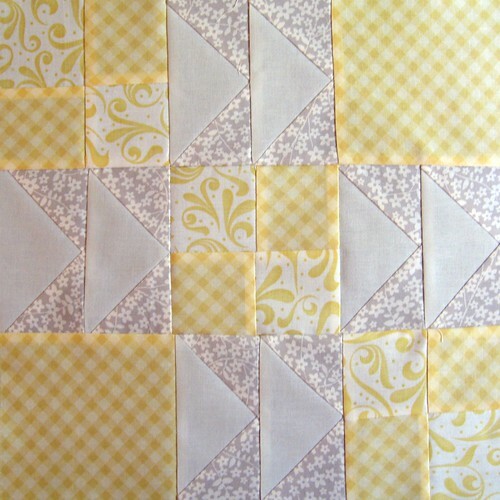 This is a gorgeous block by the way and I can hardly wait to give it a try. 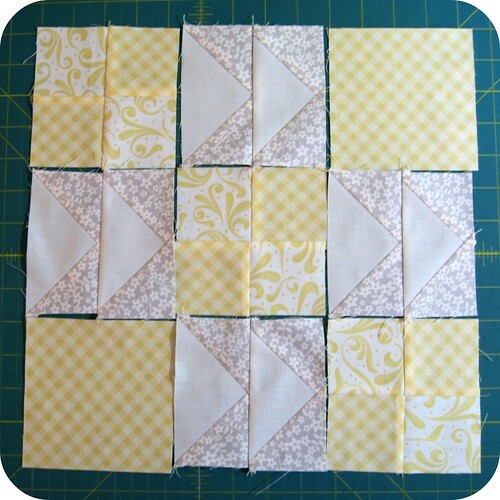 What a great tutorial...this looks like fun - I'm gonna have to jump in to this quilt-along. The accountability keeps me on my toes. 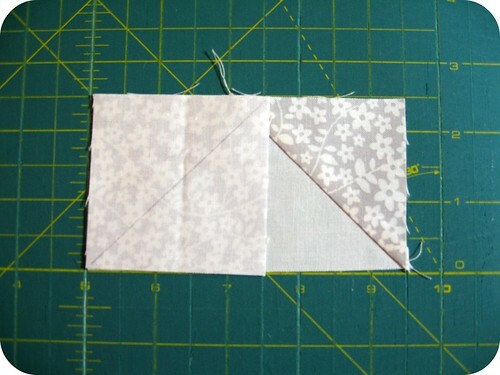 I love Quilt in a Day's Flying Geese Ruler, saves so much fabric. This is my first Quilt Along, and I am excited to get started. Love this first block! What a lovely block! I've got a lot of works in progress now - but I'm very very tempted to make this one too! Wow, your tutorial is so comprehensive. Definitely easy to follow. Jumping up and down with excitement! As soon as the kiddies are in bed I will be sewing mine up! Love this block!!!! Great block! I love the diagonals formed by the 4-patches. Great block, and great tutorial! Thanks for sharing! Gorgeous block! I can't wait to get started. Man I hope my fat 8th bundle arrives tomorrow! Wow - you write a wicked fine tutorial, sir! THANK YOU and I'm very excited to go make my first quilt-along block! OH = I have a question. Will there be any (or if so, how much) applique in this quilt? Yes!!! Thank you so much for the PDF file. It is VERY helpful. oh. my. gosh! flying geese are my absolute favourite to make right now and lookie what you have for me! Woot!! On my list for tomorrow night! Hope you are feeling better from your surgery!! Hi John. I love this block! I'm so anxious to get started on this new project! Thanks. Hopped here from Sew Deerly Loved. Wonderful tutorial. 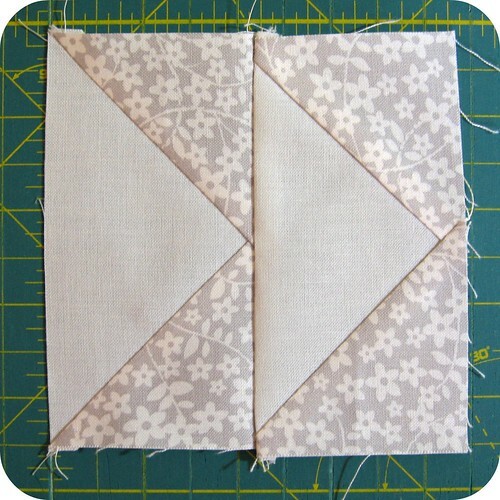 I am new to patchwork and I am going to follow with interest. can't wait to try out your excellent block. Thanks for the pdf. Can't wait to play! So glad I checked back. I found the pdf. I had so been looking forward to this Block-a-palooza and now with the pdf it is going to be so easy to follow along. Thanks for sharing your talents, love your block. Hurray! My fabric bundle arrived today! Can't wait to get started in the morning! I've ordered my fabric and can't wait to get started. Thanks for hosting this. This looks awesome. Thank you so much for putting it into PDF format. Hoping all the other blocks will be available this way as well! Thanks! I'm glad you did the PDF pattern, now I can print it out. 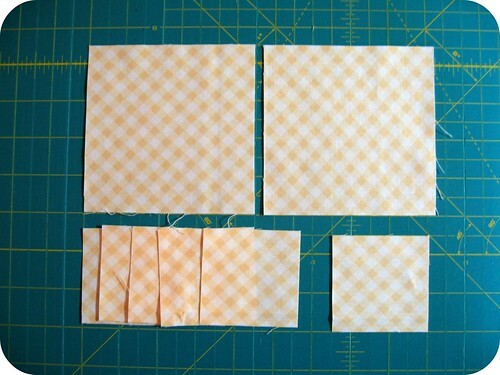 Since I'm trying to bust stash, I'm making this from various lines of fabric. When I win a prize at a quilt show with this quilt, I'll buy the entire line of "Sunkissed!" Great block! Thanks for the tutorial. Thank you so much for this tutorial and block! I've been wanting to do a quilt along for the past 6 months and I'm so glad that you all are hosting this one! The tutorial was perfect! My first flying geese and it turned out great! Thank you so very very much for this tutorial. Your instructions are amazing even for me a beginner. I just can't thank you enough. I will let you know how it turns out once I get the fabric which I ordered today. love these fabrics! Your block is great! Love this quilt along. Although I'm just fresh to the quilting, I'd decided to give it a try. 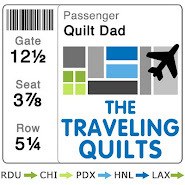 Thank-you for such a practical expression of your love of quilting. I am grateful for such detailed support in this way. God bless you. thanks john! i've never done geese so this was really fun. thanks! Think I'll join in the fun as I love the flying geese and have been following John's blog and think this will be fun. Thanks. Thank you for the great block! Looks great. Is there another way to download this is pdf without a google account? Great tutorial! Would be helpful for anyone who is not sure how to make flying geese. Thanks for the first block!